So this year’s resolution is to join the throng and blog/tweet/write/photograph and create ‘content’ more often. Gotta luv marketers – some bandwagon jumpers are even calling it ‘content marketing’. I thought I’d start off with a local event that has become global news, thanks to the fact the event was about the biggest news story in the world – not thanks to social media as some digi-spruikers would have you believe. 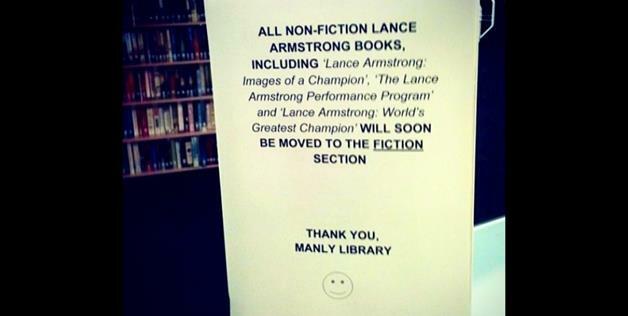 My local library in Manly has become famous because a casual library assistant, Jack Dee, posted a mock notice about Lance Armstrong books in the library window – see the photo. The notice said that Lance’s books would be reclassified and moved to the fiction section of the library – a funny joke that demonstrated a library could have a sense of humour about a topical event. A local named Dane Murray took a photo of the sign and posted it on his Twitter account. It was retweeted and then picked up by mass media who broadcast it on television, radio, newspapers and online news sites. People also sent it to their email lists and blogs. That’s the irony of social media – its lifeblood is traditional media. For if the traditional media didn’t publicise the tweet, it would reside in the closed ecosphere of twitter and other social sites and largely be missed by the population – as over 90% of social posts never get read by the list of followers/subscribers/friends et al. So a good old bit of Aussie larrikinism gets global publicity and lots of moral support in the comments about it. But here’s the rub. When Jack realised the image of this sign had gone public, he took the sign down and apologised to the council. One wonders what the apology was for – having a sense of humour, enticing locals to use the library? Certainly the sign was not offensive to anyone. I suspect even Lance may have chuckled in between mea culpa interviews. What sort of regime runs the library? Are the lunatics running the asylum? What sort of bureaucrat could even contemplate firing or reprimanding a staff member for showing a sense of humour or some initiative? Why was the question of his job situation even under consideration? It shouldn’t even be a topic of discussion. Jack Dee should be made Head Librarian! Maybe run for Mayor? Jack Dee has generated more publicity for the Manly Library with that one poster than the library has gained for itself in the decades it has been open. He showed some initiative, made us smile about a topic that is not funny – Lance Armstrong’s drug taking and cheating in professional cycling. As Dane Murray said “I think Jack is a very clever, witty, up-and-coming librarian in the Australian community”. Libraries the world over are struggling to remain relevant in the internet-world. Manly Library should frame Jack’s sign in the foyer, open a Facebook fan page, get people to Like it and maybe run a Jack Dee slogan of the week competition to “engage” (there’s one of those new buzzwords for you) locals to use the library. They could even have a Jack Dee poster signing day where the public could buy a print of the original poster and Jack could sign it for them at the library – but you must be a library member to be able to participate. I doubt it will happen though – there would be nothing in the Libraries Australia operating manual encouraging initiative. Though there is probably something about making sure you have public liability insurance for book-signings, in case someone trips over while waiting in line and sues the council for damages. That way the Library Manager could issue a statement, thus justifying their job. Manly mania. Love it. So where can I click “Like” for Jack Dee? Not sure just where I saw his poster but it put a smile on my face when I read it. Probably a lot more positive energy than I’ve ever felt walking around Manly library.